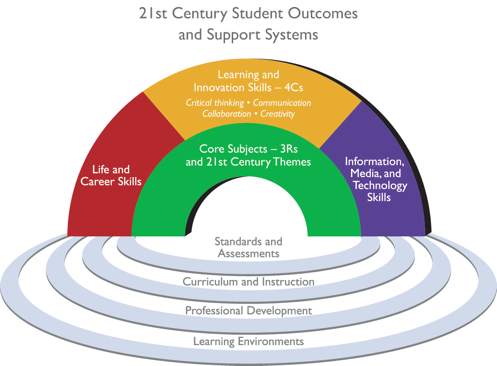 The Framework for 21st Century Learning consists of core subjects and themes that revolve around three core skills: life and career skills, learning and innovation skills, and information media, and technology skills. These are the skills that students need in order to be successful in the 21st century. The core subjects include: English, Reading, Language Arts, World Languages, Arts, Mathematics, Economics, Science, Geography, History, and Government and Civics. In addition to the core subjects, schools must integrate the 21st century interdisciplinary themes in the daily instructional activities. The themes consist of global awareness, financial, economic, business, entrepreneurial literacy, civil literacy, health literacy, and environmental literacy. The “pools” underneath the rainbow represents the paradigmatic “shift towards supporting 21st century learning, understanding, and skills performance” (Trilling & Fadel, 2009, p. 120). The “pools” consist of standards and assessments, curriculum and instruction, professional development, and learning environment.